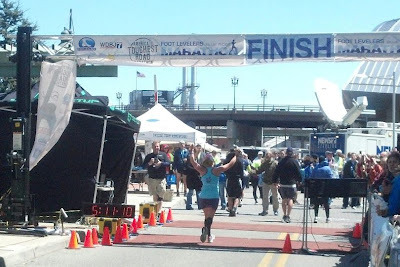 The short version: I finished my first marathon! I had FUN and I didn't vomit, pants my poop, or run into any other disasters. Chip time: 5:09:08 (11:48 pace). 9/16 in 25-29 AG. 79/143 women. 297/429 overall. Spectacular weather with great fans and race support. I loved it! And yes, I was really sore afterwards. But I'd do it again. I did NOT feel good the day before the race...dizziness, nausea, and feeling like I had the stomach flu or food poisoning. I wasn't sure if I was actually sick or if I was just really nervous and a little dehydrated. This left me worrying that race morning would be even worse and it would keep me from starting or finishing the race. But taking the day off from work and drinking my body weight in ounces of liquid seemed to help (seriously, I drank 72 ounces of Gatorade, 32 ounces of Nuun, and at least 32 ounces of water... that's 136 ounces. At least I wouldn't be dehydrated!). By the end of the day I was feeling a little better about being able to earn my t-shirt. I woke up at 4:30 on race morning with my usual feeling of pre-race nervousness. Nowhere near as awful as the day before, but it did take me a while to get my breakfast down. I took a shower to loosen up and relax, and got everything ready. We left around 6:30 and headed downtown. It was cool and breezy. Perfect for running, but not perfect for standing around beforehand! 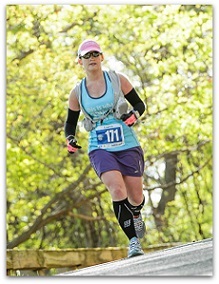 I was very glad I had my gloves and armwarmers with me...I kept them on for most of the race. The lines for the bathrooms were not bad at all and I think I cycled through them 3-4 times. We all gathered at starting line at 7:20 for all of the pre-race ceremonial stuff, almost none of which I actually heard over the crowd. 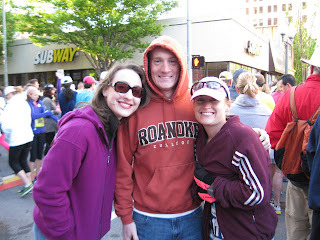 Andrew was standing with me so that he could take my jacket once the race actually started, and my mother-in-law and sister-in-law surprised me by showing up at the start line! It was great to have everybody there with me before I took off. And we were soon off and running. As I was crossing the starting line, I heard John Carlin say, "By the end of today, you will be able to say that you have run in America's Toughest Road Marathon." For some reason that made me feel really confident. I knew that I had trained really well for this race and I had run these mountains countless times. I had a plan (slow and steady) that I knew would be successful. I was ready to tackle this beast. There was a ton of news coverage for this race, including a helicopter which was able to catch some really cool aerial shots of the start. I did get a little caught up in the quickness of the start. You just don't realize how fast you're going. I also didn't hear my watch beep for my first walk break, but I looked at my watch about 6 minutes into the race and took a short walk break. It's just a little over a mile from the start before you start the first climb up Mill Mountain. I saw my parents cheering for me at the base and I headed up the mountain. With everybody around me running, the climbs went much faster than they did in training. I was so focused on everything going on around me that it all felt like a blur. During the second mile I could tell that I wasn't paying enough attention to actually running. 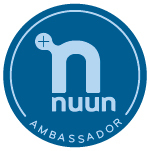 I was going a little fast and not focusing on my breathing enough, so I slowed down, took some deep breaths, and drank some Nuun. Speaking of Nuun, you will notice that I am wearing my Nathan hydration pack. I trained with this pack, so I decided to race with this pack. It was a good call. I really don't like having something around my waist for long distances. I can't even take wearing my compression capris for that long because it makes me feel uncomfortable. And sometimes I feel off-balance when I carry a handheld for too long. I also only drink Nuun on my long runs and they were serving Gu Brew and water along the course. Wearing my pack allowed me to have plenty of Nuun without having to mix it on the course with the water at the aid stations. I could also carry my phone so that Andrew and my mom could track me (with Find My Friends) and I could send out occasional text messages or take pictures if I wanted to. I also have a pretty specific nutrition routine for my long runs. Not that anyone cares, but...I always eat one Clif Shot Blok every two miles and on my training runs I also ate a Honey Stinger waffle halfway through for anything over 15 miles. For the race I ate my Clif Shot Bloks, one waffle at mile 10, and one waffle at mile 20. So having my pack allowed me to take all of that with me. It was a little heavy, but it only got lighter as I drank more. 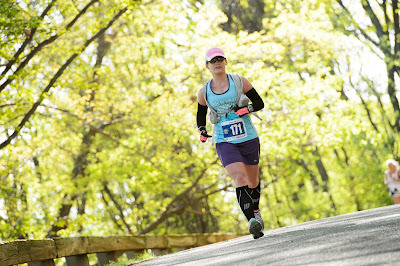 I ended up ditching my pack at mile 21 and swapping it out for a handheld full of Nuun (this was planned and I was glad to be done with wearing that pack!). For the initial climb, the half and full marathon are together. 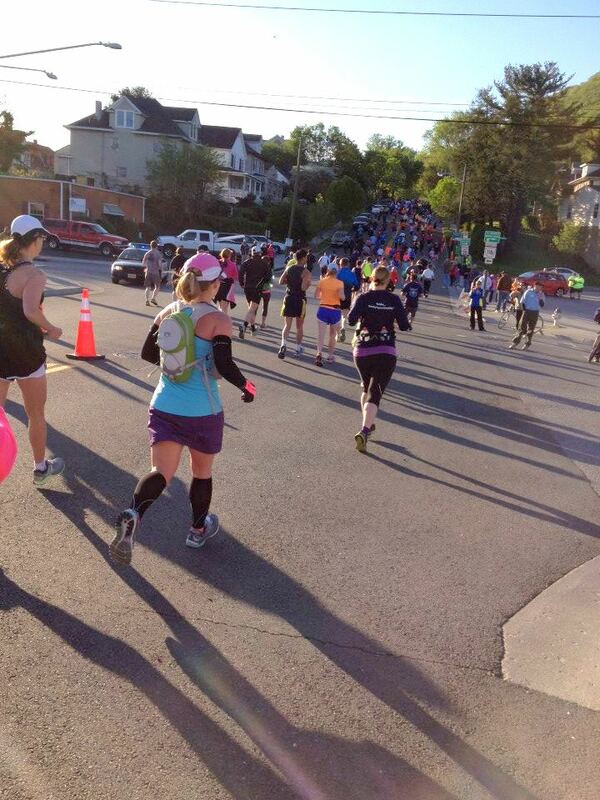 At mile 3 the half marathoners continue up Mill Mountain while the full marathoners continue towards Roanoke Mountain. After the split, the crowd of runners really thinned. There were only crazy people like me out there now! The first 15 miles of the race are quiet, secluded, and absolutely beautiful. The roads were closed except for security and other official race vehicles, but there were a few groups of cheering squads scattered throughout this section. For the most part though, it was just the sound of birds singing and feet hitting the pavement. It was awesome. As we got close to the Roanoke Mountain loop, we passed through a larger crowd. This was an exchange point for the relay runners, so there was a lot of excitement as we passed through. I think I might have high-fived Bart Yasso when I was passing through here (he was here running a relay with Frank Shorter, Bill Rodgers, and two lucky Run with the Legends contest winners). I also saw my brother up here cheering me on! He had given me some good advice the day before when I wasn't feeling good, so I told him that I was feeling great today. After this, it was time for the 4 mile Roanoke Mountain loop. I know a lot of people say that Peakwood is the hardest part of BRM, but I think Roanoke Mountain is the hardest just because it is so steep and pretty much impossible for most average runners to actually run the entire way up. Everyone around me was walking most of it. My planned 4:1 run/walk intervals went out the window here. There were a few flatter or less steep spots where I tried to run a little bit, but I walked most of the way up. Once you make your way to the summit, the view is so rewarding. I handed my phone to one of the volunteers and had her take a picture of me. 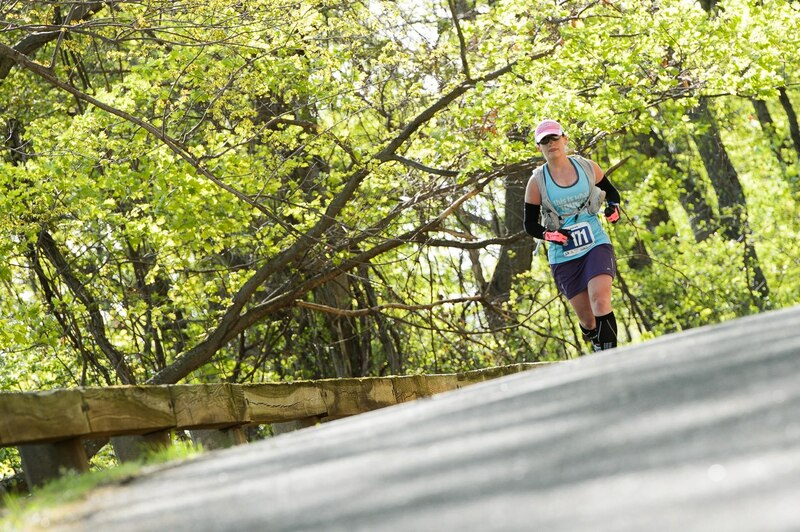 Not only is the uphill portion of Roanoke Mountain tough, the downhill part is just as bad. It hurts. Quad-busting doesn't begin to describe it. It is a steep decent for 2 miles. A lot of people make up a lot of time on this part, but I was really trying to hold back because I still had a long way to go. On the way down, I saw Kemper (who was actually our wedding photographer), and he got some really awesome shots of me. After this tortuous downhill portion, the course headed back the way we came. We passed through the same relay exchange point again and we were back on the quiet and rolling portion between Roanoke and Mill Mountain. I was just enjoying the scenery. I noticed that I kept playing leap frog with several runners throughout the entire race. We all needed to walk at different parts, some were better at climbing, and some were faster on the descents. I thought I might strike up conversations with some of these people, but due to the ever-varying paces, that didn't happen. A few lines were exchanged with a couple of runners, but nothing more than "my quads/hammies/knees/hips/feet are killing me," or "this is just getting stupid." I made my way to Mill Mountain and ran past the famous Mill Mountain Star (mile 13), the world's largest free-standing illuminated man-made star. There is another breathtaking view of the Roanoke Valley from this point, which you can see live from the Star Cam. After this comes another long, painful downhill section. Once again, I really tried to hold back and save my legs for the rest of the race. At the bottom of Mill Mountain (mile 15) my personal cheering squad and support crew was waiting for me. My husband, mom, dad, brother, mother-in-law, and sister-in-law...ALL there cheering me on. It was really nice to have that kind of personal support out there. I got Andrew to swap out some of my snacks from the back pocket of my pack to the front, and I turned onto the Greenway for a very short spurt of flat land! After this we entered into South Roanoke. We were then tortured with more ups and downs along Broadway and Avenham, and we finally reached Peakwood (aka Pukewood), the third major climb of the race. From this point on I walked most of the hills and ran all of the flat/downhills unless I needed another walking break. My 4:1 intervals just weren't lining up with when I really needed to walk. Peakwood is the part of the course that I am most familiar with because I lived the first 21 years of my life on this street. I know every twist and turn and up and down. My parents still live here (around mile 18), so of course my cheering squad was waiting for me there. As many people do along the course, my parents set up their own aid station, complete with PB&J, oranges, bananas, pretzels, Oreos, and Gatorade. I continued on Peakwood to the summit on West Ridge Road, which was of course followed by another painful downhill (are you noticing a pattern here?). Along the way everyone kept saying "just a little bit more uphill and it's all downhill from here"...liars. If only they knew that 1) the rest of the course was anything but flat, and 2) downhill hurts like crazy at this point, they might not have said this. I believe this was dubbed the "Peakwood conspiracy" by the race winner. Mile 20 - done with Pukewood! Once at the bottom of Peakwood (Rosalind Ave), you get slapped in the face by another short but steep climb up Jefferson Ave before heading back down once again. One girl passed me at this point and said, "this is just getting dumb." I laughed because I was having the exact same thought. 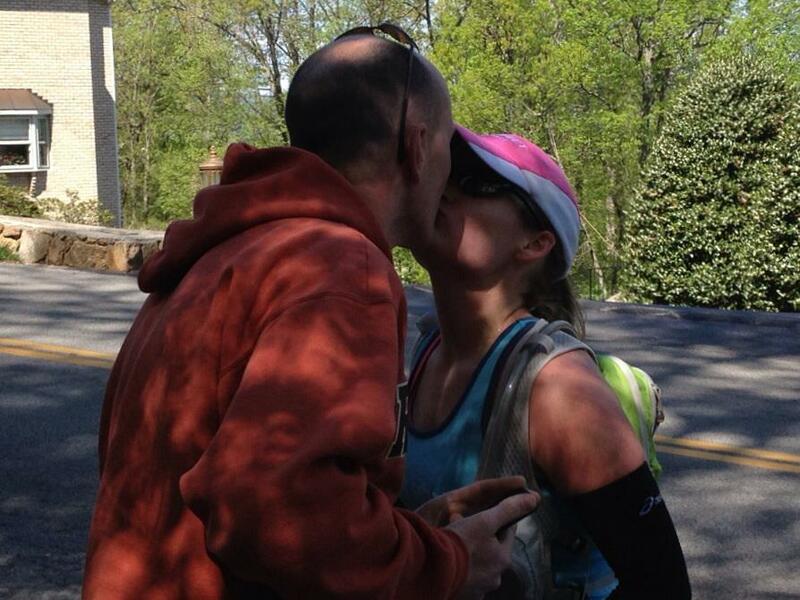 Andrew was waiting for me at mile 21 where I passed off my pack to him in exchange for a handheld full of cold Nuun. It was really nice to have the weight of my pack off of my back for the rest of the race. He also gave me a wet washcloth (by my request) to wipe the salty sweatyness off of my face and arms...so refreshing! making the hand-off...best race crew ever! 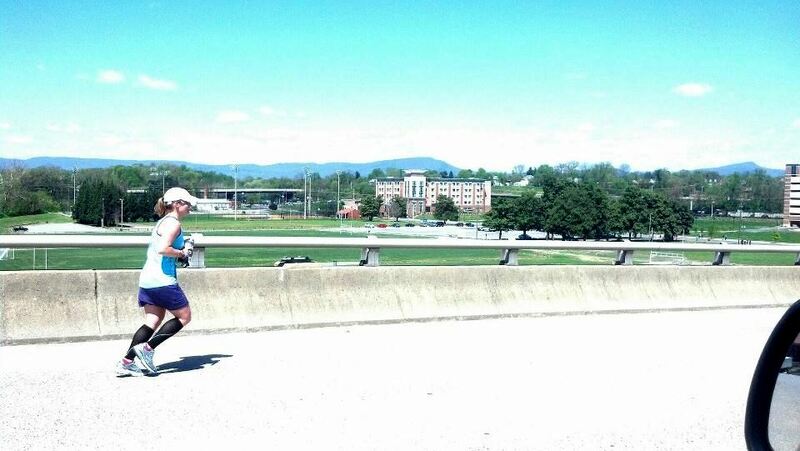 We were done with the South Roanoke portion of the course and started heading back downtown. 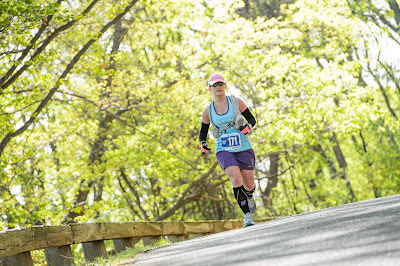 Normally the course takes a turn onto the Roanoke River Greenway, a flat-as-a-pancake path that follows the river. But due to a lot of rain recently, the flood route was in effect. I'm not a fan of the flood route because it is full of short rolling hills and bridge overpasses (read: more hills!). 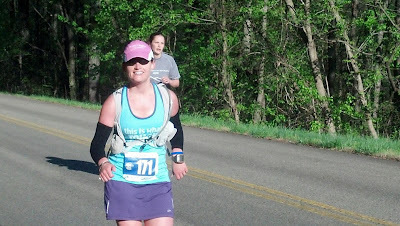 From mile 22 on (beyond the farthest I ran in training), I was just ready to be done. I don't know if I ever "hit the wall" (I feel like I would know it if I did? 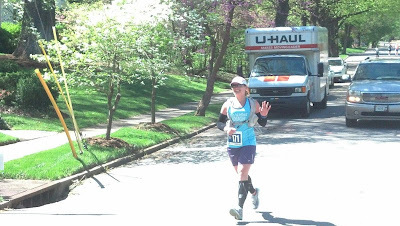 ), but after running 22 miles with more than 7,000 feet of elevation change, my body was tired and I was eager to see the finish line. I just kept chugging along, walking any incline and running any flat areas or downhills. I managed to pass a handful of people in these last miles who were struggling just as much as I was. I got really excited at mile 25. I was almost there! But that last 1.2 miles seemed to go on and on and on, which is funny because mile 25 was my 4th fastest mile. I'm glad I was able to finish with a little bit of a kick, even though it didn't feel like it. Happy doesn't begin to describe how I felt when I saw the finish line. I thought I might cry and get all emotional, but I didn't. I was just happy and proud. I did it. I am a marathoner. I was well within my time goal of 5:15! The mountain cutouts are the elevation profiles of the three major climbs on the course. Roanoke Mountain is in the back, Mill Mountain is in the middle, and Peakwood is in the front. After I crossed the finish line, I grabbed some food (a piece of pizza, oranges, and a real coke...totally hit the spot at the time) and met up with my family. One of the things I love about a smaller race is that it's very easy to find people! I walked around for a little while and stretched. I was feeling okay other than being tired and most things hurting, but I didn't feel like hanging around for too long so we all headed home after a little bit. I stretched for a little while when I got home, took a nice long shower, and sat on the couch for a little too long. We went out to dinner at Fork in the City, where I stuffed my face with a delicious burger and a side of mac & cheese, and I stole 2 pieces of Andrew's pizza. After dinner we went on a short walk to stretch out my legs, and then to top off my massive dinner with some ice cream at Pop's. Hungry, much? 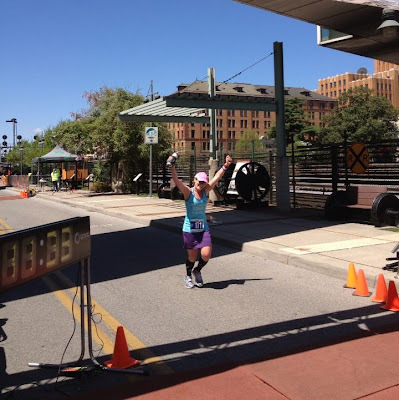 For me, being able to train on the course was key to having a successful first marathon on this course. Not necessarily physically (though that definitely helped), but mentally. Knowing where all of the ups and downs came along the course helped me to tell myself to keep going up because there would be a down right around the corner. 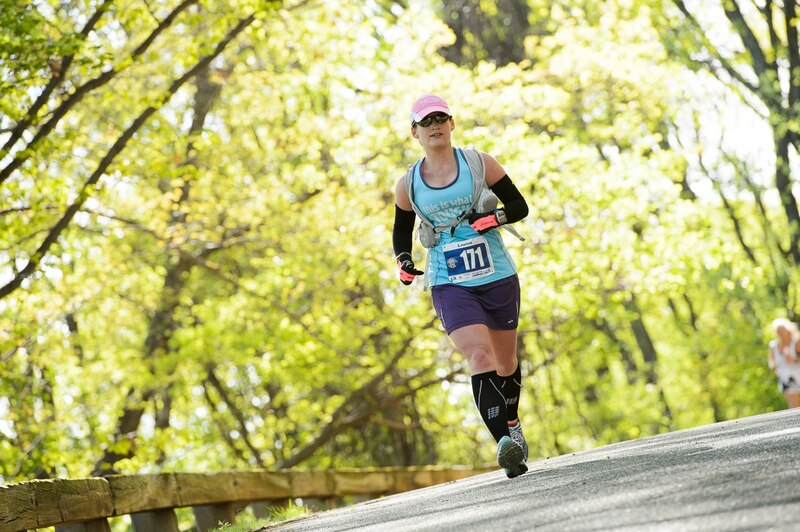 I didn't spend a lot of time looking at my watch wondering when the next mile marker would come, because I knew where I was mileage-wise throughout the whole course. The miles really seemed to click by for me because I wasn't wondering when it was going to end the whole time. If I had been unfamiliar with this course, I feel like I would have been more pessimistic along the way (OMG, when is this hell hill going to end?!? ), which I think would have translated into feeling more physically worn out. 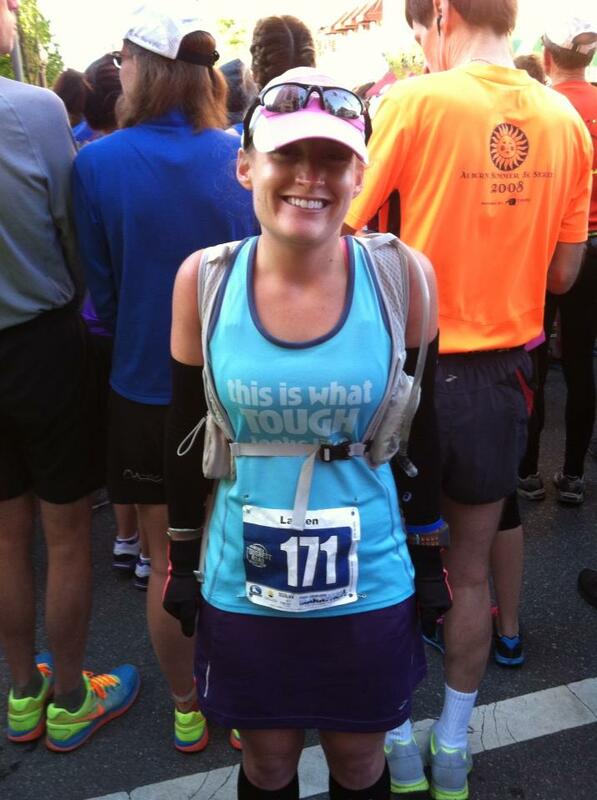 Running a marathon really is 90% mental. I know some people swear off ever doing a marathon again after their first one, but the thought never crossed my mind. I would do it again, especially this race, in a heartbeat. Honestly the hardest part of the whole thing was the training...the 18, 21, and 22 mile training runs that feel like a marathon themselves. The cheering crowds and race support were phenomenal. Having an aid station, complete with 2+ porta-potties, every ~2 miles is almost unheard of in a race this size (429 in the full, 797 in the half, and 49 5-person relay teams). 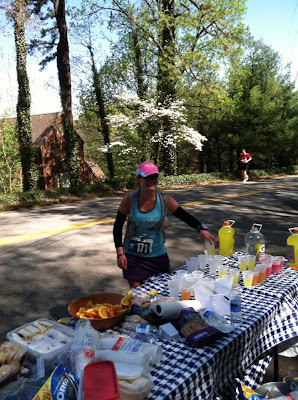 Many people in the South Roanoke area also set up their own aid stations, complete with oranges, bananas, PB&J, snickers, frozen grapes, and beer. Not only is this course challenging (making you feel awesome for just finishing), but it is absolutely gorgeous. Since most people aren't going for a PR on this course, everyone should take an extra minute and enjoy all of the beautiful views along the way. The race shirts were gender-specific technical shirts and I really loved the different designs/colors for the half and full. In previous years the shirts were unisex cotton shirts with very little difference between the half and full. This year's shirts were a huge improvement! The race medals were beautiful and high-quality. And they were different this year! Although the previous years' medals were also very nice, they looked the same for three years in a row. Yet another great improvement. The organization of this race was seamless. 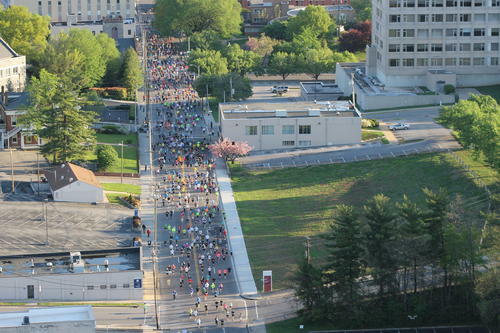 A local news station, WDBJ7, provided live coverage of the race. This was new this year and very cool! I recorded it watched it later while I was recovering from the race. It was nice to be able to see the leaders since I was so far behind them. This race has really gained some major exposure this year and I know this coverage helped even more. After what happened in Boston the Monday before the race, police security was increased a ton. I definitely felt very safe. Some people said they felt violated by all of the extra security, but I didn't feel this way at all. Post-race food was yummy and plentiful, even after the majority of runners had finished. The Down by Downtown Festival ("a celebration of music and culture") was going on close to the finish line. Even though I didn't stick around for it, this was nice for spectators and other runners who weren't as exhausted as I was to enjoy after the race. And as for the negatives of this race...well, I honestly can't think of anything. I have a lot of people to thank for making it possible for me to do this race. I know they don't think they played any part in it, but they did. My husband and #1 fan was so supportive and encouraging throughout all of my training and was so helpful during the race. He rode with me on my 22 mile training run, and he was always right where I needed him to be on race day. 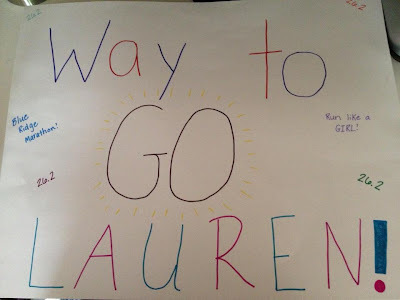 My #2 fans, my parents, brother, sister, and in-laws, were also very supportive of me finishing my first marathon. I loved having all of them there cheering me on during the race. And I can't forget about my Team Tough Chik ladies, who were encouraging and provided much-needed advice and encouragement throughout my training. I received countless wishes of good luck and congratulations from friends and coworkers and random Twitter followers that I don't even know, and this really meant a lot to me. I really felt like I had an army of people behind me the whole time, and I want to genuinely say, thank you so much! I think this concludes the longest race recap EVER. If you've made it this far, thanks for reading! If you are reading this and you're considering running in a future Blue Ridge Marathon race, DO IT! You won't regret it. It's the day before my first marathon. And right now I'm sitting on the couch, watching Boston coverage, drinking Nuun, and trying not to vomit or ship my pants. I woke up for work this morning and literally staggered around the room to shut off my alarm. I was dizzy. Not cool. I went to the bathroom. What happened in there was also not cool. I went downstairs to fix my breakfast. That didn't happen. I soon returned to the comforts of my bed, feeling hot and nauseous. This was not good. I have a marathon tomorrow...gahhhh!! I actually wanted to go to work today so that I could stay busy and not think about the race too much, and I'm already taking off on Monday because I anticipate being incapacitated. But going to work today was just not going to happen. So I called in sick. I laid in bed for a while and Andrew brought me a glass of water and a banana (though it took me a while to stomach the idea of eating it). I fell back to sleep while he was getting ready, and woke up again, still not feeling so great. I came downstairs so that I could be closer to the food, if I ever got hungry, and I've been sitting on the couch ever since. Thankfully some Pepto has made my nausea go away, and I've been able to eat some cereal and a bowl of PB oatmeal. My first thought was that this was all due to my pre-race nerves, but this seems so much worse than that! And if I woke up this morning feeling this bad, what is tomorrow morning going to be like? Will I even make it to the starting line? I can't go down like this! I've trained for nearly 5 months, and most of my long runs went great, leaving me feeling confident that I could finish. And unlike the last time I tried to train for a marathon, I am uninjured. The weather tomorrow is going to be nearly perfect! I will be beyond disappointed and upset if I don't feel good tomorrow and I'm unable to run. Yes, I realize that this may seem somewhat irrational to all non-runners, but I know for a fact any other runner/athlete has felt this way before. I believe this is what people refer to as performance anxiety. And I really have no reason to be nervous. This is going to be so much easier than my long runs! There are people out there handing me food and water and cheering for me. 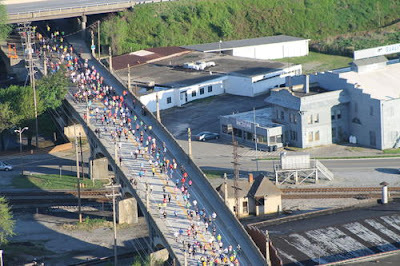 There will be porta-potties every two miles. And it will be so much fun conquering such a challenging course with 500+ other marathoners...a bunch of running buddies! So I'm really really really hoping that whatever this is gets out of my system today and I wake up feeling normal tomorrow morning and that I'm able to eat breakfast. I don't think running a marathon on an empty stomach would be a very good idea. I'll be taking it easy today and will be heading over to packet pickup this afternoon. But I'm sure I'll only get more nervous as the day goes on, which will probably just make things worse. I just need to trust that everything will be okay. I cut my left big toenail way too short last week. I was afraid that it was getting ingrown (I've never had an ingrown toenail). I had decided that a toenail wasn't going to stop me from running a marathon, but I was legitimately afraid that it would get infected as a result of running in the marathon and that my toe would have to be amputated. My toenail feels fine now. The inside of my ankle was hurting. I'm pretty sure this was from trying to transition to wearing flip flops so I've been wearing my running shoes all week. I was pretty convinced that it was Posterior Tibial Tendonitis, which would lead to a DNF and I would end up in a boot for 6 weeks or never run again. My chiropractor worked her voodoo magic used some laser therapy and it's feeling better. Eating sweet potatoes the night before long runs worked really well for me during training. I was afraid that there would be a run on sweet potatoes and I wouldn't be able to find any at the grocery store. Thankfully I have secured my sweet potatoes for tonight. I'm worried that I will forget to apply Body Glide everywhere it needs to go and it will just be ugly. I'm also worried about forgetting my race bib. I should probably pin it to my shirt tonight. I'm worried that I will get caught up in the start of the race and go out too fast. I really need to pace myself and stick to my 4:1 run/walk intervals. Taking a walk break 5 minutes into the race is going to be tough and humbling and I hope nobody makes fun of me for walking so early on. And of course, I'm afraid of tripping over a curb and breaking every bone in my body between now and then. Thanks for listening to me freak out. Getting my thoughts out on "paper" always helps me to feel a little better. I'll try to do an update tomorrow or Sunday. Wish me luck!